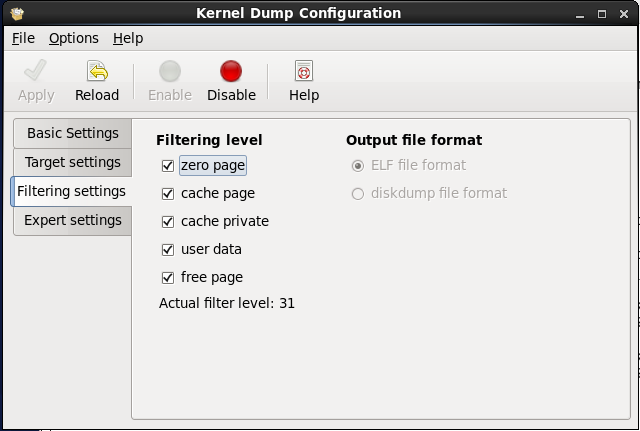 Kdump is a kernel crash dumping mechanism that allows you to save the contents of the system's memory for later analysis. It relies on kexec, which can be used to boot a Linux kernel from the context of another kernel, bypass BIOS, and preserve the contents of the first kernel's memory that would otherwise be lost. In case of a system crash, kdump uses kexec to boot into a second kernel (a capture kernel). 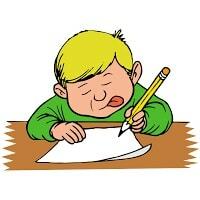 This second kernel resides in a reserved part of the system memory that is inaccessible to the first kernel. 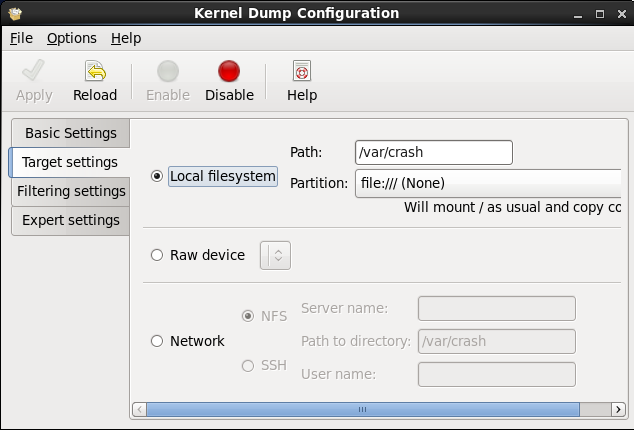 The second kernel then captures the contents of the crashed kernel's memory (a crash dump) and saves it. In order for kdump to be able to capture a kernel crash dump and save it for further analysis, a part of the system memory has to be permanently reserved for the capture kernel. On some systems, it is possible to allocate memory for kdump automatically, either by using the crashkernel=auto parameter in the bootloader's configuration file, or by enabling this option in the graphical configuration utility. The amount of reserved memory is either determined by the user or is used, it defaults to 128 MB plus 64 MB for each TB of physical memory (that is, a total of 192 MB for a system with 1 TB of physical memory). NOTE: Make sure you are in runlevel 5 before running the below command or else it will throw out an error. 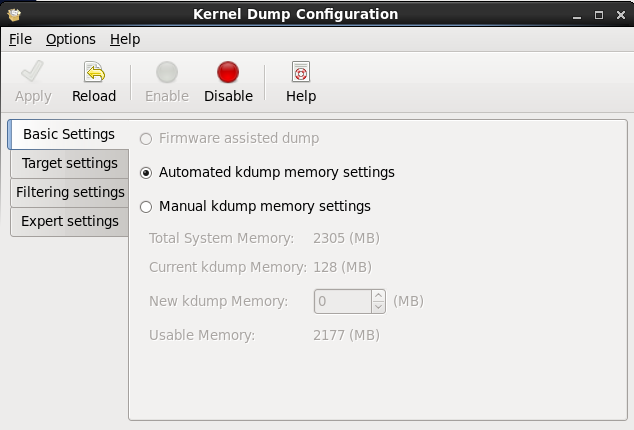 The Basic Settings tab enables you to configure the amount of memory that is reserved for the kdump kernel. To do so, select the Manual kdump memory settings radio button, and click the up and down arrow buttons next to the New kdump Memory field to increase or decrease the value. Notice that the Usable Memory field changes accordingly showing you the remaining memory that will be available to the system. The Target Settings tab enables you to specify the target location for the vmcore dump. It can be either stored as a file in a local file system, written directly to a device, or sent over a network using the NFS (Network File System) or SSH (Secure Shell) protocol. # /usr/sbin/makedumpfile -R "/tmp/vmcore-`date`" < "vmcore.flat"
The Expert Settings tab enables you to choose which kernel and initial RAM disk to use, as well as to customize the options that are passed to the kernel and the core collector program. To reduce the size of the vmcore dump file, kdump allows you to specify an external application (that is, a core collector) to compress the data, and optionally leave out all irrelevant information. To enable the dump file compression, add the -c parameter. This will force the Linux kernel to crash, and the address-YYYY-MM-DD-HH:MM:SS/vmcore file will be copied to the location you have selected in the configuration (that is, to /var/crash/ by default). To analyze the vmcore dump file, you must have the crash and kernel-debuginfo packages installed. To display the kernel stack trace, type the bt command at the interactive prompt. You can use bt pid to display the backtrace of the selected process. PID: 2482 TASK: ffff8800377a7500 CPU: 0 COMMAND: "bash"
Now these crash dump mostly contains hexa decimal values which you can send to your OS support team as they can guide you further if case it is related to hardware/kernel issues.